Some 18 months ago a journalist wrote a piece for The Guardian about settlements without wi-fi, mobile or television connections. Among the places he located was Rhenigidale. The telephone was a long time coming, but once it arrived there was a difference. It was via a radio link to Skye rather than by telephone lines to the exchange in Tarbert. To what extent the hostel and its surrounding buildings are cut off now is a question to be asked. Are they? Is it possible to ‘Go Off-Grid’ there? 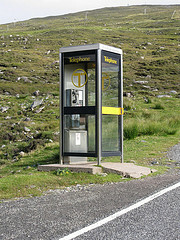 The phone box pictured here is a marker on the route from the junction on the Stornoway – Tarbert road to the hostel. It is just beyond the spot where the road divides – one way onto Maaruig; the other in the direction to Rhenigidale. I have known people to shelter, to rest, to fumble for coins in the slot there, but have never encountered anyone on the phone in this remote section of BT’s Outreach service..